Hi all, I'm writing this guide with the intension of trying to get more interest in WoE, it still has a LOT of work to do. Please add your comments, suggestions and feedback. I need to know if this hits the target audience and is inspirational enough... well not yet, I'm writing the core sections now. 2. What is WoE and why should I WoE? Most WoE guilds use an external voice chat program to give commands to members so they know what to do and where to go. This allows for communication that is more effective that type due to its speed. Example of such programs include raidcall and teamspeak. Be aware that you’ll most likely be required to download and use one of these programs – listening is mandatory but speaking is optional and from my experience most people choose not to speak. The conventional in game methods of communication are still more than valid in WoE. Things such as PMs and guild chat become more relevant. Public chat becomes less relevant due to enemies seeing in and frost joke and scream being spammed (there is a silent version of these but nt everyone uses it). I’d say this would be the main channel to communicate with during WoE as everyone in the guild can see it. Please try to avoid speaking in the party channel as not everyone in the guild is in the same party. Direct – You can directly PM someone if you require something unusual from them such as a blacksmith repairing a broken gear. /hi -This command is very useful for quick communication as it sends a PM to everyone on you friends list. Friend support classes relevant to you and use /hi to get buffs from them. Or whatever is relevant to you in order to quickly inform the support classes of what you need. Support classes should have a 2nd chat window open for whispers so they know who to buff. Stacking is the practice of overlapping the sprites of a guilds players. It is done in order to make it harder for the enemy guild to target key classes. To stack, click just outside the guild and then cast firstaid (or any skill that stops movement) when you are walking through the guild's stack. You can try to stack on top of other players in town for practice. This is self explanatory, put gears in your quick slots and change them in appropriate situations. Don’t expect to be able to do this right away, the learning curve can be a bit steep for WoE so start doing this when you’re more comfortable with your other roles. This section goes over the basics in how to set your client up in order to make communication more efficient and in order for you to see messages that you may need to read more clearly. Below is an example of how to set up your client. I’m sure that others have other preferences; this is what I’m comfortable with. The chat box should be divided into different tabs for different purposes. Here is an outline of a few options of chat tabs. I have more than this as you can see, I'd just recommend these as a minimum, other people will have other ways to set themselves up - just pick a way to show all the required info in a setting that you're comfortable with. 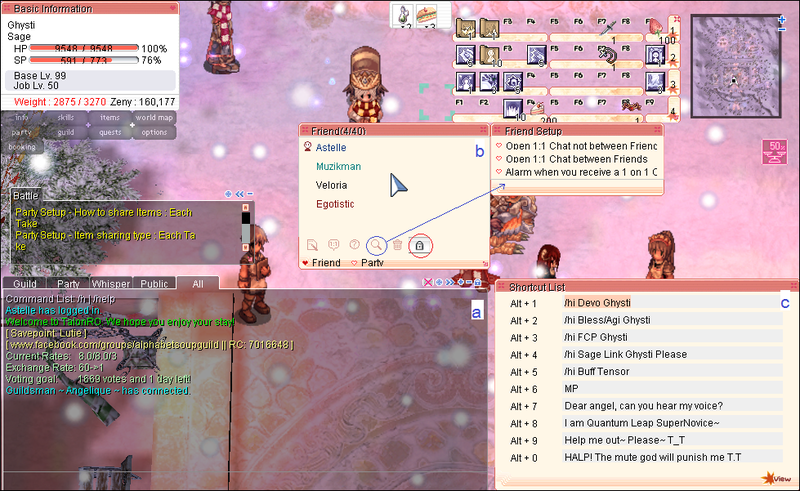 This would be your standard table which contains all chat channels such as public, guild, PMs, etc. You'd use this one in PvM or whatever. This tab will only have the Guild channel turned on, people should be communication here and you won't pick up and Frost Joke or Scream spam that may happen. This should be kept as a tab outside your main chatbox tabs. It's used to give you information about what is going on around you and about who may require your services. Here's a list of options to include in this tab. Skill Failure Message Display – Good for indicating when you have not met the conditions required for a skill such as no gems or link. Equipment On/Off Display – Useful for classes where you regularly change equipment, also helps notify you when you are stripped. Abnormal Status Message Display – Useful for knowing when you’ve been buffed or have lost your buffs, shows notifications such as “blessing aligned” and “blessing cancelled”. Party Member’s Abnormal Status Message Display – same as above but for party members, important to have open as any support class so that you can know when to rebuff party members ie “__’s blessing cancelled” indicates that you should renew the said party member’s blessing. All support skills that target a guild member should be done by clicking names in here. This is used for quick communications to support classes. Use alt+a number key to quickly execute the command specified in the box. Use this to efficiently say your /hi commands to your guild members. This section doesn’t aim to provide the best, expensive and most effect builds instead I aim to give the logic behind the basic formula to building WoE characters along with suggesting gears for a low budget that will make someone adequate for WoE. Here is an outline of various elements to consider when building a WoE character and an explanation of all of them. Due to the frequency of the spell storm gust and bards using frost joke, freeze immunity is very important. It's a waste of time for the priest to use recovery on lots of people. This is another annoying and common status effect. Dancers/gypsies spamming scream and meteor storm from wizards are the common ways of being stunned. a) 97 VIT - most common way, uses status points though, consider adding cheap vit food to your build if you take this path. I wouldn't say that this is key to every build however it helps especially when you need to get back to the guild or you're taking a lot of damage. Most classes with wear a thara frog shield. Beret is the cheapest by far. These are the two factors that affect the rate at which a player can spam skills (excluding ping). If I recall correctly, the delay of a skill is given by whichever of these two factors that gives the highest delay. For example, if someone had 190aspd and was using a skill with a 1 sec acd, they'd need to wait 1 sec to use another skill. However, if they were under a 150 INT bragi, there would be an 80% reduction in acd. This would mean a 0.2 sec acd. Since 3 skills per second is slower, the skill spam rate will be affected by aspd. It is beneficial for some classes to add AGI in order to increase aspd. Aspd also varies with weapon type. Check the list on irowiki for more details. A large part of healing and SP recovery is achieved using potions because of this people should consider adding int and vit into their builds. Each point placed into these stats increases the effectiveness of potion by 2% (vit for hp and int for sp). The more effective the potions, the less you'll need and the longer your consumables will last. Investing in increase recuperative power or increase spiritual power can also be quite handy for this purpose. Also, slim potion pitcher is the main skill used for healing a guild (except in NT), vit increases the effectiveness of this skill on your character. This simply helps you carry more consumables so that your inventory lasts you longer. It should be balanced with your potting stats to ensure your consumables last as long as possible. Here is a compilation of wiki pages where you can get more info about various aspects of the guide.